Old Government House circa 1883. 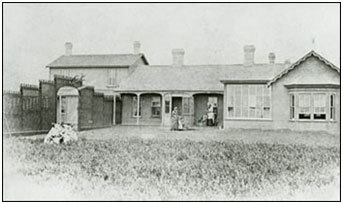 Government House was first constructed on a ten acre allotment of government reserve land approximately five kilometres west of the town of Regina. At first the residence was intended to be a temporary dwelling until more suitable accommodations could be constructed in the community. Constructed in 1883, the structure was assembled from several prefabricated buildings that were built in eastern Canada and transported to the new site. 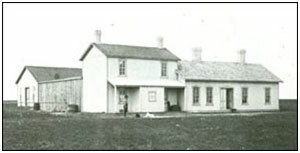 Old Government House circa 1887. Designed by the staff of the Department of Public works in Ottawa, Government House as it looked at the time was a single story wooden structure comprised of two portable houses. Later that year Lieutenant Governor Dewdney would contract additional construction programs and the site was developed into a more imposing structure, reflecting the sort of atmosphere imperialists at the time, expected for the vice - regal representative. Additions were made to the original structure in 1883. Following the completion of these additions Government House included four bedrooms, two dressing rooms, drawing room, dining room, a large and small kitchen with pantry and storeroom, a front veranda and porch, and a conservatory. Several additions were added after its construction in 1883 to enhance the overall appearance of the building. The veranda, conservatory and bay window were added to the front of the building. The lattice fence added to the property's appearance and separated the servant's quarters from the vice-regal area.